After over 10 years of lobbying, family farmers across the country, who produce organic milk, are celebrating the release of strict new U.S. Department of Agriculture (USDA) regulations that establish distinct benchmarks requiring the grazing and pasturing of dairy cows and other livestock. Many hope that the new rule will put an end to the abuses that have flooded the organic market with suspect milk from a handful of mega-dairies generally confining thousands of animals in feed lots and barns. The issue has been a lightning rod for controversy in the organic community. At least five times during the last decade, the National Organic Standards Board – a key USDA advisory panel made-up of industry stakeholders – passed guidance or recommended regulatory changes clarifying the requirement that dairy cows and other ruminants must be allowed to exhibit their native behavior and consume a meaningful amount of their feed from grazing on pastures. New rulemaking had been delayed by the Bush administration, using a myriad of tactics, some of which are being scrutinized in an ongoing investigation by the USDA’s office of Inspector General. The Cornucopia Institute, on behalf of its family farmer members, also filed numerous formal legal complaints with the USDA’s National Organic Program calling for investigations into alleged violations of organic livestock management practices occurring on many of the 20 largest factory farm facilities. The biggest scandal in the history of the organic industry centered around one such USDA investigation with the regulators finding “willful” violations of 14 organic regulations on factory farms operated by Aurora Dairy, a $100+ million company based in Colorado (Aurora produces private-label, store brand milk for Wal-Mart, Costco and large grocery chains). “The public controversies concerning Aurora, and alleged improprieties by the largest milk processor in the country, Dean Foods (Horizon Organic), put increasing pressure on the USDA to rein-in the scofflaws in this industry,” Kastel added. “I am confident that the new rule, along with a commitment to rigorous enforcement by certifiers, will put an end to these abuses and restore fairness to the organic dairy sector,” said Kevin Engelbert, a dairy farmer from Nichols, NY who milks 100 cows. “Consumers will be able to purchase organic dairy products with confidence, knowing that regardless of the label, the animals who produced the milk were on pasture, as nature intended,” Engelbert added. The USDA has announced that they will begin this month hosting a series of workshops around the country with the nation’s 50+ organic certification agencies and other industry stakeholders. The sessions are intended to clearly define the meaning and intent of the new rule so that certifiers, who conduct annual farm inspections and review organic system management plans, will understand what the regulations require from farmers and only approve management practices that strictly conform to it. Specifically, the new rules require that dairy cows and other ruminants be out on pasture for the entire growing season, but for not less than 120 days. It also requires that the animals receive at least 30% of their feed, or dry matter intake (DMI), from pasturing. In addition, organic livestock will be required to have access to the outdoors year-round with the exception of temporary confinement due to mitigating and documentable environmental or health considerations. The 120-day/30% DMI benchmarks were negotiated reference points agreed-upon by organic community stakeholders and arrived at after a series of meetings and discussions, nationwide, over much of the last half dozen years. The rules were also a carefully crafted consensus aimed at ensuring that legitimate organic dairy operations could truly provide meaningful pasture for their herds across the wide range of climatic zones in the U.S. 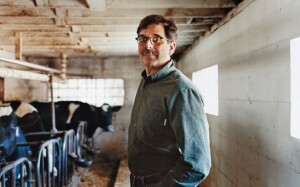 It is estimated that the rule will impact upwards of 2,000 organic dairy farmers. Cornucopia, a farm policy research group, along with agricultural producers and other organizations, are carefully scrutinizing other impacts on the most sweeping rewrite of the federal organic standards since their inception in 2002. In addition to dairy cattle, the standards will assure humane animal husbandry practices in eggs, poultry, beef and pork production. The USDA will also be accepting public comments for 60 days on one exclusion from the pasture minimum, that for “finish feeding” on grain for ruminants, including beef cattle — an issue that proved controversial and elicited a wealth of public comments when the original draft rule was published. The Cornucopia Institute, a Wisconsin-based nonprofit farm policy research group, is dedicated to the fight for economic justice for the family-scale farming community. Their Organic Integrity Project acts as a corporate and governmental watchdog assuring that no compromises to the credibility of organic farming methods and the food it produces are made in the pursuit of profit. Their web page can be viewed at www.cornucopia.org. You can contact Mark Kastel at 608.625..2042.